Yesterday, I shared the details of my annual cookie exchange along with some fun printables. I host a party every year at my house during the holidays where my girlfriends come over and we have a fun girls night in. We exchange cookies and laughs and it is wonderful to spend time with all of them during the busy holiday season. 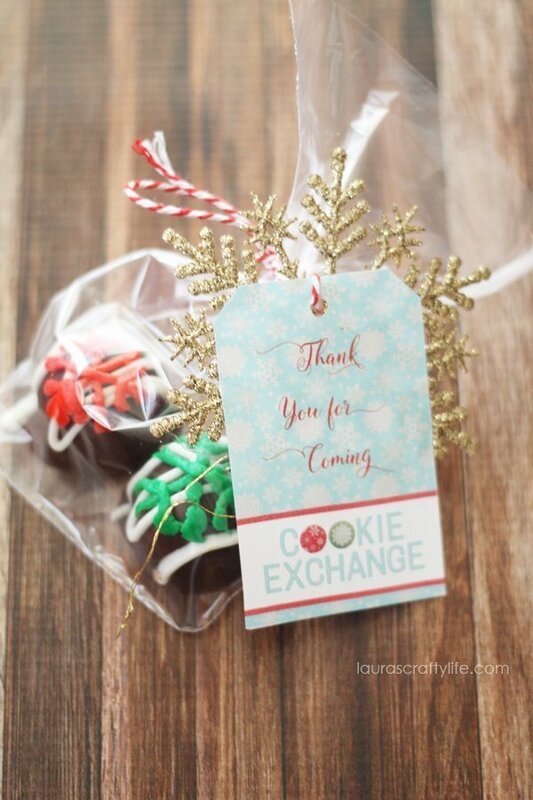 Today, I am going to share with you more details on how to create the cookie exchange favors. 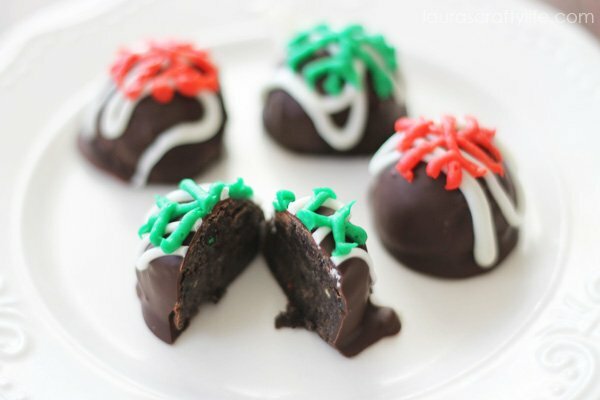 I am not sure if you have ever tried an OREO Cookie Ball, but it is like a little ball of heaven wrapped up in chocolate. So yummy! Since this is my fourth year hosting the party and a lot of the same women come year after year I have to get creative on what to give out as favors. I have already done cookie cutters and wanted to try something new this year. I love to give out favors people can eat because then they are not stuck with more “stuff” to take home during this time when “stuff” seems to be coming in around every corner. 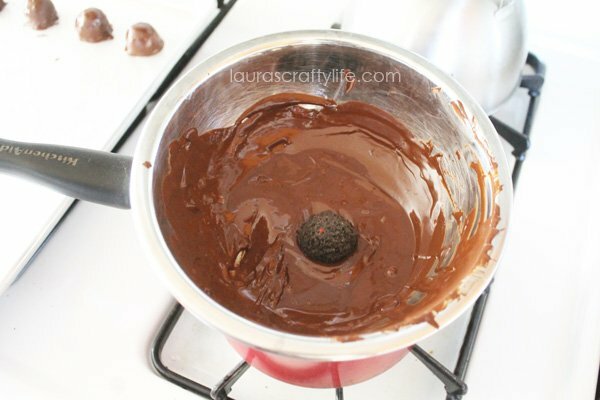 The best part is the OREO Cookie Balls are so easy to make, they just take a little bit of time to chill. 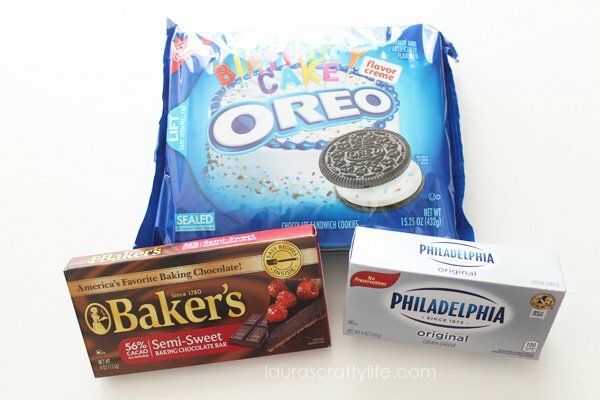 And, they are easy to make your own by using different flavors of OREO cookies, cream cheese, or the type of chocolate you dip them in. 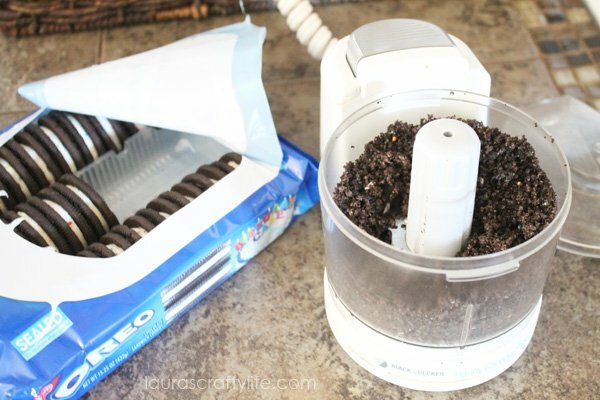 You start by crushing up thirty-six of any flavor OREO cookies. I chose to use the birthday cake flavored cookies. I used a small food processor. It holds only 5 cookies, but I got them all crushed up in about a minute or two. You then mix in one package of softened brick cream cheese, any flavor. I opted for the plain original cream cheese for mine. 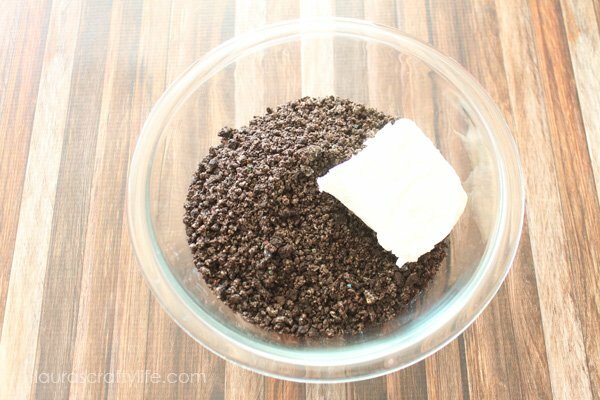 I found it was easiest to use a spatula and kind of smoosh the cream cheese into the crushed OREOs until I could mix it a little better. You then shape the mixture into 1-inch size balls. I have a little cookie scoop that worked perfectly for this. Then freeze them for ten minutes. While the OREOs are in the freezer, melt four packages of 4-ounce semi-sweet baking chocolate. I don’t have a double boiler, so I add about an inch or two of water to a pot. I place a metal bowl over the top of the pot and heat the water. Be careful when touching the bowl as it will get hot! 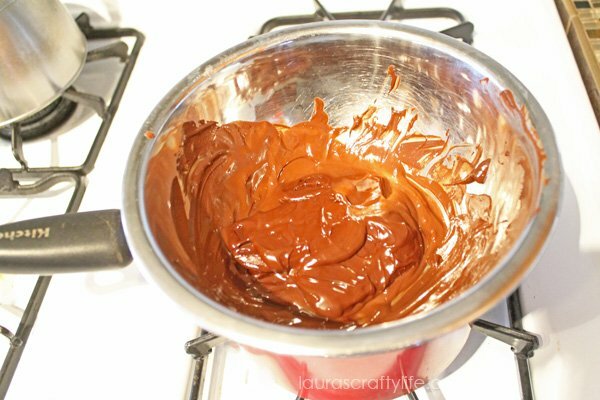 Stir the chocolate until it is completely melted. Once the OREOs have been in the freezer for ten minutes, take them out and dip each one in the melted chocolate. 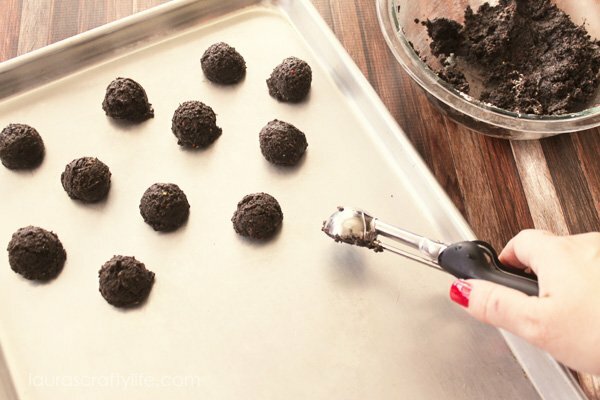 Place the dipped OREO Cookie balls in a single layer on a wax paper-lined baking sheet. To make my treats a little extra special, and to fit in the snowflake theme of my cookie exchange, I added a white chocolate drizzle and a frosting snowflake on each one. I took white chocolate chips and melted them in a microwave safe bowl. Place the chips in the microwave for 15 seconds at a time. Take them out, stir them and microwave them for an additional 15 seconds, stirring each time until completely melted. I scooped the melted chocolate into a plastic sandwich bag. Clip just the tip of the bag off. Be careful because the chocolate will pour out right away! 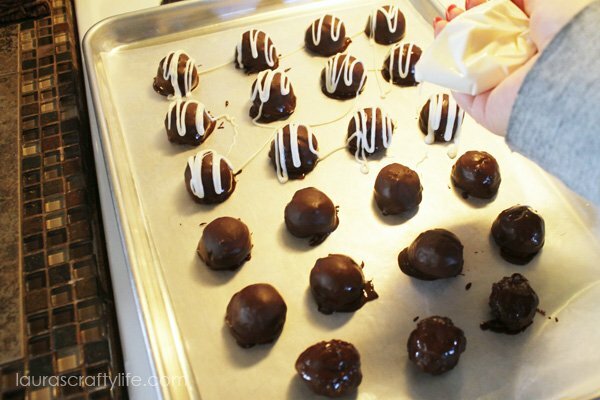 Drizzle the white chocolate over the OREO Cookie Balls. I then used prepared decorating icing that comes in a tube. You could also make royal icing or buttercream icing to pipe the snowflakes, but since I knew I would be only using a small amount, I opted for the pre-made kind. 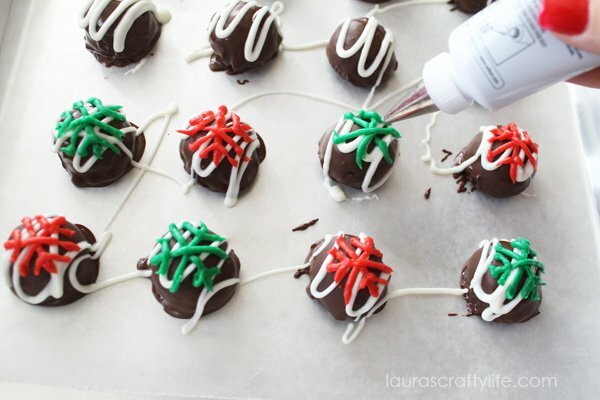 Using a small round tip, carefully pipe on a snowflake on each OREO Cookie Ball. I created a larger asterisk shape on each one and then on every other tip of the snowflake I piped on a “v-shape”. Once you have them all decorated, refrigerate the balls for one hour or until firm. 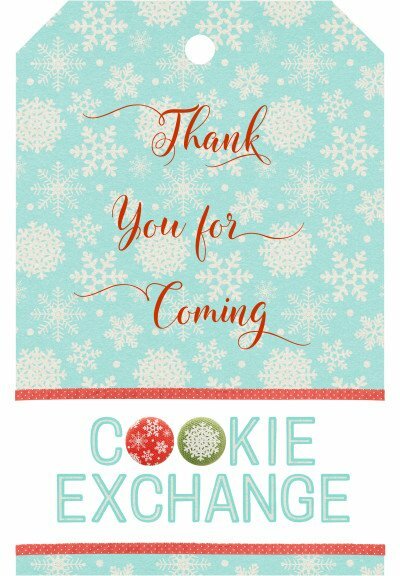 I created thank you tags for my cookie exchange party. Each printable sheet contains nine tags. 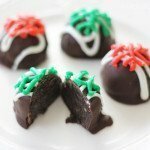 To finish up the cute favors, I placed two decorated OREO Cookie balls in a small clear cellophane bag. I found some glittery snowflakes in a pack of twenty in the Christmas section at Walmart. I threaded red baker’s twine through the hole of the ornament as well as the gift tag and tied it onto the bag. Each guest at the party received a favor bag when they went home. 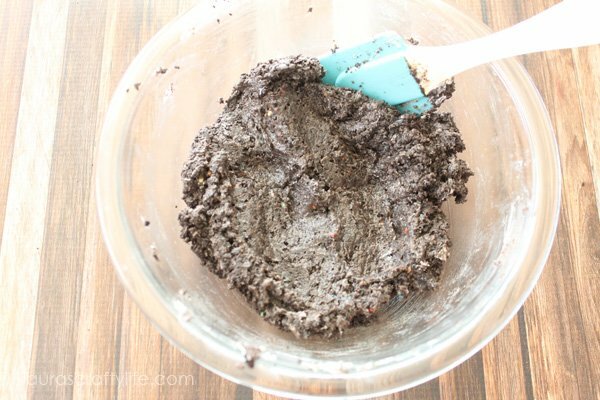 You can find everything you need to make your OREO Cookie balls at Walmart. 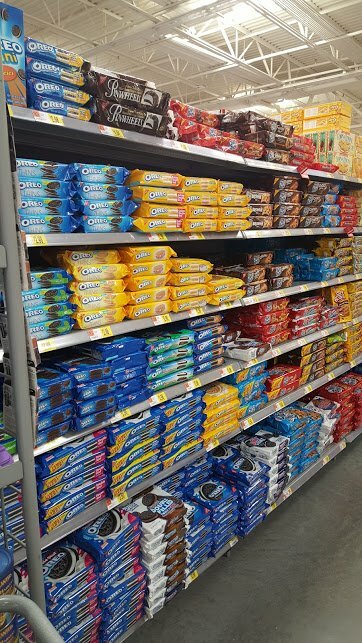 There are many varieties of OREO cookies to choose from. 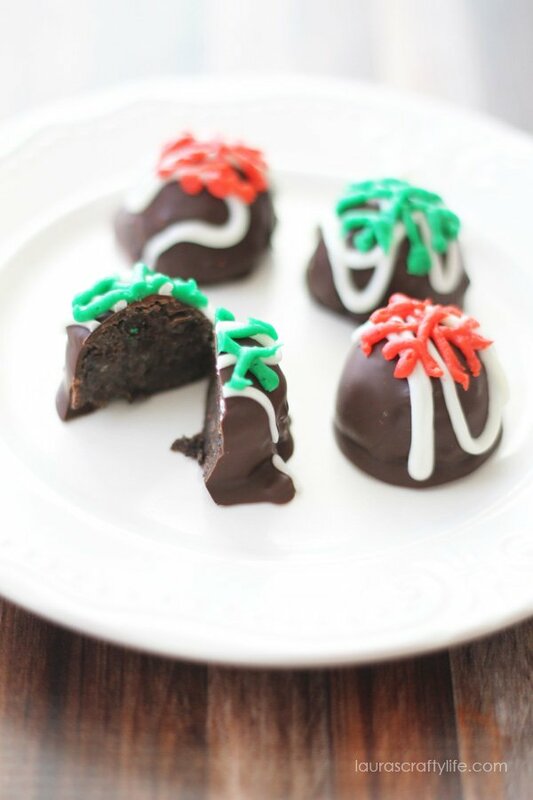 Make this delicious treat for your holiday parties. Optional: Drizzle on melted white chocolate and pipe on snowflakes using decorators icing.